After posting my ' A bloggers guide to twitter chats' which you can read HERE you guys seemed to really enjoy it and found it useful! So I thought I would make another one, this time strictly dedicated to if you are hosting a twitter chat. Just for a bit of background information, I hosted the lifestyle bloggers chat on Sunday the 13th of September and the topic was ' making your blog stand out from the crowd' Don't worry you don't need a million twitter followers ( I definitely didn't have) or any special requirements , it's really simple and I hope that my step by step guide can help some of you in hosting your first twitter chat, enjoy! HOW DO ON EARTH DO I GET TO HOST A BLOGGERS CHAT? Don't worry there isn't a horrible 12-week process to go through, where someone gets fired each week ( though I do love the apprentice) You simply contact the twitter chat you want to host. Send them a short and sweet but polite DM, that you are showing interest in hosting a chat and see if they get back to you. It might take a while for them to get back to you, as their schedule may already be full up. An alternative method is keeping an eye on their feeds to see if they are advertising for twitter chat host. HOW DO YOU PICK A GOOD TOPIC? A good topic with excellent questions is the most important thing about being a great twitter chat host. You need to pick a topic that relates to the chat you are hosting. So if you are hosting a beauty chat, it's probably advisable to host a chat about beauty or makeup. You need to pick a topic that you enjoy but also you can think of a good number of questions for! HOW MANY QUESTIONS SHOULD I HAVE? To be honest in past experience around five or six is the best number. In some chats, they have like seven questions and you have to type like the speed of Usain Bolt to keep up, it's insane! The same goes for four or fewer questions, it can get a bit boring and you feel like you are plodding along like a tortoise! But it is totally up to you! In terms of preparation, you need to find a place that is comfortable for you, where you won't get distracted. Because trust me, you won't be able to leave the chat alone for 10 seconds! I also used a buffer, to schedule the questions. This way I didn't have to worry about missing the hashtag off or spelling something wrong. Which let's face it, would have been tragic! You also need to decide on what device, you shall be hosting said twitter chat. I recommend a laptop or tablet, just because they tend to be faster at picking up new tweets! Make sure you have a spare device next to, just in case the UN-imaginable happens and your phone dies or you lose Internet connection! WHAT CAN I DO TO MAKE MY PERSONALITY COME ACROSS? HOW DO I RESPOND TO EVERYONE? You won't! If you are hosting one of the big twitter chats like Bloggers do it better or lifestyle bloggers, over 60 people could answer you question in a matter of minutes. You can't keep up! People will start to have their own conversations as well with you still tweeted in it, nothing makes sense to you! It's like thousands of people talking all at once to you! You will feel like your head is about to explode! HOW MANY PEOPLE SHOULD I INTERACT WITH? It's a good idea to reply to as many people as possible in that short period of time before the next question is up! Retweet and favourite tweets as well, just hold back on retweeting everyone because people still need to see when the next question has arrived. Twitter chats really do put the phrase " fastest finger first" into perspective! DO YOU GAIN FROM TWITTER CHATS? I gained slightly but, to be honest, it's not about how many followers you gain, it's about being able to connect with Lot's of other bloggers and ask them questions! It's so much more than just numbers at the end of the day! 100% Your fingers will hurt like hell afterwards and your phone will sound crazy for an hour, pinging every 2 seconds! ( It's best to put it on silent) but it's such a great bonding exercise and a privilege to be able to talk to so many brilliant bloggers! I hope this has helped you if you are going to be or thinking about hosting a twitter chat in the future! I can't recommend it enough, that you all go and try it out! Have you ever hosted a twitter chat? What did you think of the experience? Let me know in the comments below! I've hosted the #ltbloggers chat in the past and I'm due to host #askablogger the week after next, I'm a lil scared but I got this! I loved this post and was considering doing one similar, but you seem to have covered everything! Definitely saving it for future reference as something to read over before I next host. You should definitely take part in more, they are so fun! 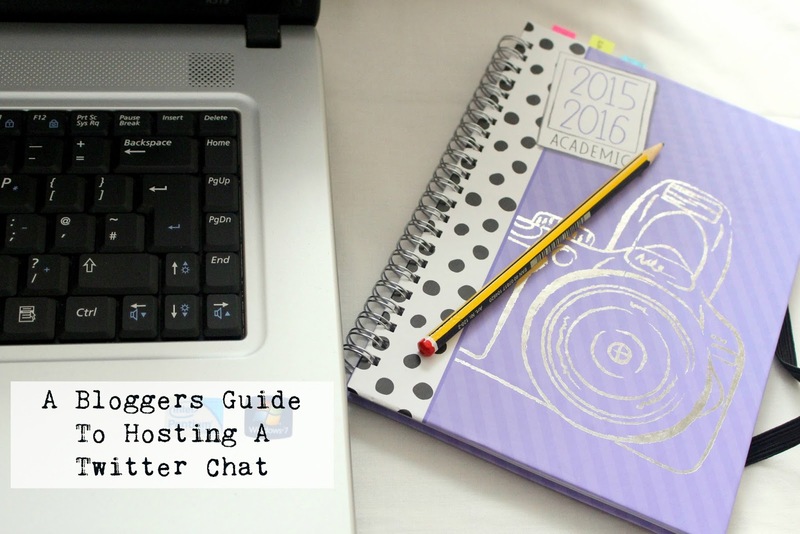 I've never thought about hosting a bloggers chat, the idea appeals to me though! I'd love to host a Twitter chat, they seem like so much fun! Great tips! I've hosted 2 twitter chats and loved hosting them! It's so fun and you get to know some new bloggers and other people's thoughts on your topic. I hosted a Twitter chat a couple of weeks ago and I loved it!!! This is such a helpful post and very original too!